The treaty on the non proliferation of nuclear weapons, commonly known as the Non-Proliferation Treaty or NPT, is an international treaty that aims to limit the spread of nuclear weapons and weapons technology by promoting non proliferation, disarmament and cooperation in using nuclear energy for peaceful means. The treaty opened its signatory to all nations in 1968, with Finland being the first to sign; the treaty becoming fully functional in 1970. After twenty five years of the NPT, member nations at the 1995 NPT Review and Extension Conference, which was then held in New York at the United Nations, agreed “that the Treaty shall continue in force indefinitely.” As a matter of fact NPT is the first agreement that most member nations have actually “agreed” a statement that makes NPT significant. Today 189 nations are a signatory to NPT. Signatory member nations include five Nuclear Weapons States (NWS): the People’s Republic of China, France, Russian Federation, United Kingdom and the United States, although four UN member nations have not yet ratified NPT: India, Israel, Pakistan and South Sudan. However the fourth country South Sudan has not ratified the treaty yet, but looking at the ongoing conflict, is not capable of producing nuclear weapons. The Democratic People’s Republic of Korea ratified the NPT in 1985, but in 2003, the nation announced its withdrawal. The NPT is solely dependent upon three main ‘pillars’: non-proliferation, disarmament, and peaceful use of nuclear energy. Nuclear weapon states (NWS) shall not be transferred to any recipient irrespective of their forms (nuclear weapons or other nuclear explosive devices) and no nation shall assist, encourage or use nuclear technological means on other non-nuclear weapon states (NNWS). No nation shall acquire nuclear technology or manufacture them. NNWS shall not receive nuclear weapons of any sort, nuclear explosive devices and shall not manufacture or acquire. NNWS must safe guard all their nuclear materials under International Atomic Energy Agency (IAEA) safeguards and these safeguards should be followed at all times. Member nations are free to exchange equipment, materials, or scientific and technological information but that shall only be done for peaceful means. Member nations shall discuss progressive ways for nuclear disarmament in general and complete disarmament and international control. The third pillar allows and agrees upon the transfer of nuclear technology and materials to NPT signatory countries but that should only be limited to civil nuclear programs for development and the program shall continue as long as the nations demonstrate the use of nuclear energy for development. Although there are few nations unwilling to give up nuclear technology, the third pillar of the NPT ensure that no member nation acquires the nuclear technology and abides by the instructions stated in pillars one and two. These pillars however have made conditions difficult to develop nuclear technology for member nations. The availability of fissile material has always been considered as a “principle obstacle”, and “pacing element” for nation’s ambitions for nuclear development, hence it was emphasised more in the 2004 US policy to prevent enrichment of uranium and plutonium (a.k.a. “ENR”) technology. Of nations that have ENR capabilities, it is widely feared they may harness the uranium or plutonium, thus giving them a perfect opportunity for ‘virtual’ terrorism. To ensure this doesn’t happen, the IAEA regularly inspects nuclear facilities and verifies the accuracy of documented supplies. The agency inspects inventories and analyzes samples for nuclear material, safeguards implemented to ensure premature exposure of nuclear materials. Monitoring of all the rules and regulations takes place and exports of sensitive material are watched, especially from greater powers such as Britain and United States through involuntary organizations such as the Nuclear Suppliers Group. The major concern for IAEA is that nuclear material (especially for civil purposes) can only be harnessed upto a certain limit, and if a nation does harness beyond its point, plutonium can take a form that will be suitable for bomb production. The safeguards set by the NPT are a must for all signatory members. Although referring to the three non signatory nuclear capable nations (India, Pakistan and Israel), specific nuclear regulations apply. IAEA inspectors visit the sites regularly to ensure completeness and accuracy of these records. However, the terms of the NPT cannot be enforced by the IAEA itself, nor can nations be forced to sign the treaty. Situated in a conflict zone, Israel is equipped with advanced military capabilities, and for decades has maintained ambiguity regarding its WMD programs. Nuclear experts agree that Israel has nuclear capability, some long range intercontinental ballistic missiles (ICBM) perhaps, although no such current programs exists under the official Israel nuclear or chemical programs. Israel has an arsenal of short and medium range ballistic and cruise missiles, and is now focusing on multilayered missile defence capability. David Ben Gurion, Israel’s first prime minister, secretly established the nation’s first nuclear programs in 1950 and Israel secretly gathered the essential equipments for an ICBM in the wake of May 1967 which lasted until the Six Day war. On the official channel Israel feels vulnerable if it loses its nuclear weapons and uranium enrichment ability. Although Israel has always been a supporter of ‘nuclear free Middle East’, it is also reluctant to negotiate a mutual understanding with the Arabs. Once a part of the British India and now two globally recognised rivals, the tension between the two nations is escalating today, and both nations are equipped with a significant amount of nuclear weapons. The two nations came face to face within few months after independence which was followed by three wars in the 20th century. Both nations were looking for something, stooping one another in getting their hands on. That something was nuclear capability and introducing the program in 1967 and conducting its first successful test in 1974, India became a nuclear power. Pakistan wanted it more, and it was now out of time; the Pakistan nuclear program began in 1972 and they successfully tested their first launch in 1999. This way both the nations violated the NPT and armed with an arsenal of 100, both nations did not agree with the rules of NPT so they did not sign it, because there was no point in signing a treaty they had already violated before. Being a national of one of the two countries I hate to say that these two nations pose an enormous threat to the international community, two neighbouring nations equipped with more than 100 nuclear weapons and fighting over a sensitive issue like Kashmir. One fires a nuclear weapon to avert humiliation and defeat and the other fires a missile to counter that launched; there goes our Earth. The last time our Earth faced such an enormous threat from a nuclear launch was when skirmishes were fought all over the Indo – Pakistan border, which nearly escalated into an all out war. This self saturated, self contained state is the only nation ever to have withdrawn from the NPT. The war between South Korea and the DPRK is going on as we speak, hence there is no official peace treaty, only peacefire agreements existing. Skirmishes between the two nations are at times constant, and on numerous occasions all out war had ensued. As it has been fighting wars since its establishment, DPRK has the fifth most populous army in the world, with 1 million of its 21 million population, despite lacking behind the GDP per capita. It is also equipped with a small nuclear arsenal, hence them opting for an easier solution: exiting the NPT, thus releasing themselves from the shackles of NPT regulations. However, the DPRK will always use these weapons as deterrents, because losing the support from the People’s Republic of China will be a costly affair. The NPT is like a lock on a shed, it only keeps the good people from doing the unthinkable. There is no teeth in this treaty to really make the nations that have gone rogue comply with other member nations. The easy step is not to sign, or drop out and avoid being sanctioned by other nations. 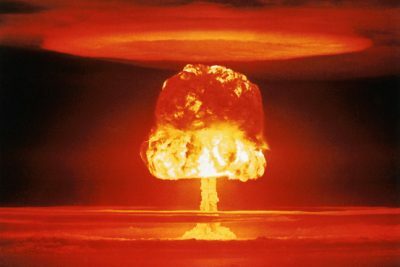 Until there is a real "fair" international force to contend with the production of nuclear materials for peace or bombs that is enforceable, we are just seconds away from mass annihilation by a human error. How frightening, because not all of these nations use the same rationale and pride sometimes gets in the way of their decisions. In the Bible it is said to say "Pride cometh before a fall." What a fall it will be and the recovery from it is not guaranteed.